Avengers assemble! While the cast of this movie (with the exception of the Hulk) came from previous movies, The Avengers you know and love nearly never happened. 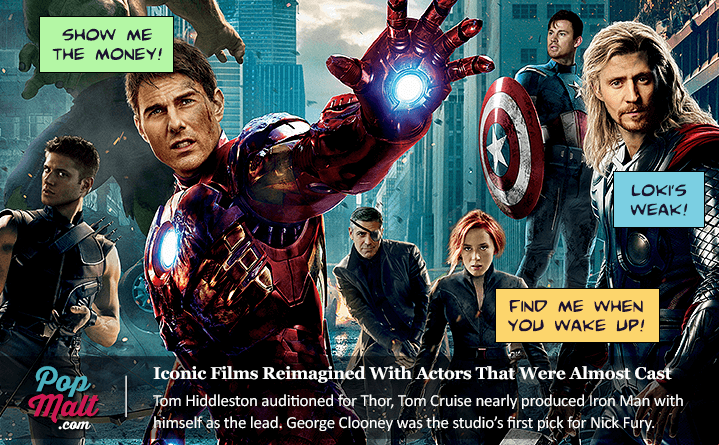 Iron Man: Tom Cruise was originally slated to produce and star in the first Iron Man film, a move that would have inevitably put him in The Avengers as Tony Stark as well (as Marvel is crazy with their decade-spanning multi-picture contracts). Hugh Jackman, Nicolas Cage, and Sam Rockwell (who later appeared as a villain in Iron Man 2) were also considered before the producers landed on Robert Downey Jr.
Black Widow: Interestingly enough, Tom Cruise’s Live, Die, Repeat” co-star Emily Blunt was a top contender for Black Widow, which would have put the two in multiple movies together (assuming LDR still had made the same casting decisions). Natalie Portman (who ended up being cast in Thor), Jessica Alba, and Angelina Joli were also among those considered for the role. The Hulk: Edward Norton, who had appeared as Bruce Banner/Hulk in a stand-alone movie already, was set to reprise his role, but lost interested in the character after The Incredible Hulk, his previous effort as the title character, stalled. 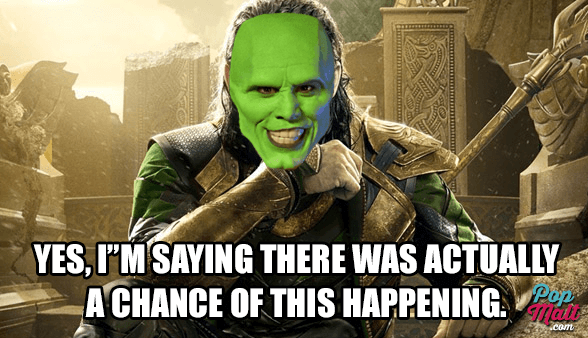 This left the role wide open for Mark Ruffalo. Mark’s performance in this role was widely acclaimed, and he’s been crushing (er, smashing) it ever since (with four pictures left, according to an interview he did with Collider). Hawkeye: Supernatural’s Jensen Ackles was considered for the role of Hawkeye, which would have likely gone over well, but Jeremy Renner was definitely the more deserving name, having already starred as the lead in several blockbuster roles. Captain America: Channing Tatum had been in the running for Captain America, but lost out to Chris Evans. Chris might not bring the magic like Channing does, but he was certainly no stranger to the Marvel Cinematic Universe, having already played the Human Torch in 2005’s Fantastic Four. Why he was allowed to play two characters remains unknown, but considering Marvel’s lackluster performance with the Fantastic Four movies (back in 2005 and this year’s effort), perhaps they just figured nobody actually saw that movie anyway. Will Smith and Avatar’s Sam Worthington were also in talks with producers regarding the role. Nick Fury: Perhaps one of the biggest potential upsets with The Avengers cast would have been with the casting of George Clooney as Nick Fury. George Clooney was actually Marvel’s first choice for Nick Fury, and the studio courted him for quite some time. Clooney turned down the role after researching the character and coming across some of the darker lesser-known incidents in the comics, one in particular where Nick Fury kills somebody in a violently grotesque manner. Even though the movies have been more or less family friendly (they’re Disney, after all), Clooney couldn’t be swayed. Enter Samuel L. Jackson, who isn’t scared off by a little over-the-top sensationalized violence in a character’s closet. Marvel even changed Nick Fury’s race in some of the newer Ultimate Avengers comics as a result of Samuel L. Jackson taking over the role in the movies (Fury used to be white, and at one point was played by David Hasselhoff in a made-for-TV movie Nick Fury: Agent of SHIELD). Thor: Tom Hiddleston, who ended up playing Loki in both the Thor movies and The Avengers, had his eyes on the character Thor originally. Instead of being sent on his merry way after failing to impress as Thor, the producers offered him the part of Loki. Why he didn’t see that himself is hard to understand, but alas, the rest is history. Other note-worthy considerations for the role of Thor included Daniel Craig (the first choice, believe it or not), Channing Tatum, and Liam Hemsworth, whose brother Chris ultimately was cast as the Asgardian crown prince. Which of these near casting decisions surprised you the most? Are there any that you would have preferred over the real cast? Let us know in the comments section below, and be sure to share this article with your friends if you enjoyed it!